Earlier study suggested that 3,4-dihydroxytamoxifen (tam catechol), a tamoxifen metabolite, is proximate to the reactive intermediate that binds covalently to proteins and possibly to DNA (Dehal and Kupfer, 1996). The current study demonstrates that rat and human hepatic cytochrome P-450s (CYPs) catalyze tam catechol formation from tamoxifen (tam), 3-hydroxy-tam (Droloxifene), and 4-hydroxy-tam (4-OH-tam). Higher levels of catechol were formed from 4-OH-tam and 3-hydroxy-tam than from tam. Evidence that human hepatic CYP3A4 and 2D6 catalyze the formation of tam catechol from 4-OH-tam and supportive data that the catechol is proximate to the reactive intermediate, was obtained: 1) There was a good correlation (r = 0.82; p ≤ .0004) between steroidal 6β-hydroxylase (CYP3A activity) andortho hydroxylation of 4-OH-tam in human liver microsomes; 2) monospecific antibodies against CYP3A4 strongly inhibited catechol formation from 4-OH-tam and its covalent binding to proteins in human liver microsomes; 3) low levels of ketoconazole inhibited catechol tam accumulation and covalent binding of 4-OH-tam to human liver proteins; 4) among human P-450s expressed in insect cells (supersomes), only CYP3A4 and 2D6 noticeably catalyzed catechol formation, and cytochrome b5 markedly stimulated the CYP3A4 catalysis; and 5) human livers with high CYP3A and low or high CYP2D6 activity exhibited high catechol formation and those with low 3A and 2D6 activities formed only little catechol. These findings demonstrate that CYP3A4 and to a lesser extent 2D6 catalyze tam catechol formation and support the participation of tam catechol in covalent binding to proteins. Tamoxifen (tam)1, a member of the triphenylethylene (TPE) class of compounds that exhibits antiestrogenic activity, is the current endocrine therapeutic agent of choice for all stages of breast cancer (Jordan, 1993). Recent large scale clinical trials of tam as a chemopreventive prophylactic agent in women considered at risk of breast cancer demonstrated protection in 45% of the subjects (Fisher et al., 1998) and resulted in its approval by the Food and Drug Administration for that purpose. Of concern, however, are the findings that tam increases the incidence of human endometrial cancer and causes hepatocellular carcinoma and a high abundance of p53 mutations in rats (Killackey et al., 1985; Williams et al., 1993; Vancutsem et al., 1994). Tam is not mutagenic in microbial systems and the mechanism of its carcinogenic activity is not understood; nevertheless, the possibility that tam metabolites are involved in carcinogenesis has been considered (King, 1995; Dehal and Kupfer, 1996). In view of these concerns, several TPE derivatives (possibly devoid of uterine carcinogenic activity) are being developed as therapeutic agents against breast cancer, among these 3-hydroxy-tamoxifen (3-OH-tam; Droloxifene). 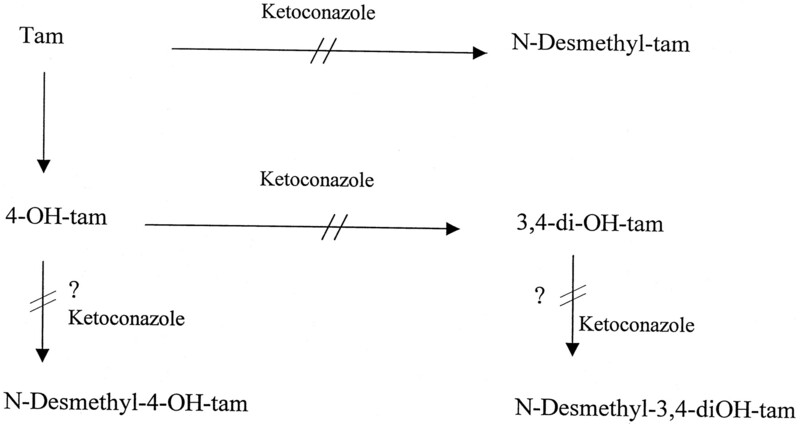 The major metabolites of tam in mammalian liver are tam-N-oxide, mono-N-desmethyl-tam and 4-hydroxy-tam (4-OH-tam; Foster et al., 1980; Reunitz et al., 1984; McCague and Seago, 1986; Fig.1). Whereas tam-N-oxidation is catalyzed primarily by the flavin-containing monooxygenase (Mani et al., 1993a), certain cytochrome P-450s (CYPs) also catalyze that reaction (Dehal and Kupfer, 1997). Tam N-demethylation is primarily catalyzed by hepatic CYP3A (Jacolot et al., 1991; Mani et al., 1993b) and although the mammalian enzyme catalyzing tam-4-hydroxylation resisted identification, P-450TCDD isolated from livers of TCDD-treated chick embryos effectively catalyzed that reaction (Kupfer et al., 1994). Recently, it was suggested that that human hepatic CYP2D6, 2C9, and 3A4 catalyze tam-4-hydroxylation (Crewe et al., 1997). By contrast, our studies with several systems (human liver microsomes and cDNA-expressed human P-450s) demonstrated that tam-4-hydroxylation is catalyzed by CYP2D6 and that the other CYPs were inactive (Dehal and Kupfer, 1997). Major pathways of tam metabolism. Tam undergoes metabolic activation by hepatic P-450 enzymes, resulting in reactive intermediates (RIs) that bind covalently to microsomal proteins (Mani and Kupfer, 1991; Kupfer, 1996). Although the ultimate RI has not been identified, it appears that 4-OH-tam is on the path of formation of the RI that binds covalently to proteins (Dehal and Kupfer, 1996) and possibly to DNA (Randerath et al., 1994;Pathak et al., 1995). Recently, we demonstrated that4-OH-tam undergoes ortho hydroxylation catalyzed by hepatic microsomes, yielding 3,4-dihydroxy-tamoxifen (3,4-di-OH-tam) catechol that appears proximate to the RI that binds covalently to proteins (Dehal and Kupfer, 1996). Our earlier observations that CYP3A catalyzes hydroxylation ortho to the phenolic moiety of several compounds (Stresser and Kupfer, 1997) and that CYP3A is involved in covalent binding of tam to proteins (Mani et al., 1994) suggested that this enzyme could transform 4-OH-tam and 3-OH-tam into tam catechol (Fig. 2) and catalyze subsequent covalent binding. Pathway of 3,4-di-OH-tam (catechol) formation from tam, 4-OH-tam, and 3-OH-tam (Droloxifene). The current study demonstrates that CYP3A enzymes (human and rat) and human CYP2D6 catalyze the hydroxylation ortho to the phenolic moieties of TPEs, exemplified by the hydroxylation of4-OH-tam and 3-OH-tam. The catalytic activity of CYP3A toward certain substrates is often increased by the presence of cytochrome b5 (Yamazaki et al., 1996) and we observed that cytochrome b5 markedly stimulates the CYP3A4 catechol formation. Additionally, indirect evidence is provided that the catechols are proximate metabolites to the RI that binds covalently to proteins. NADPH, glucose 6-phosphate, glucose 6-phosphate dehydrogenase, EDTA, dexamethasone (Dex),catechol-O-methyltransferase (COMT), troleandomycin (TAO), and S-adenosyl-l-methionine iodide salt (SAM) were purchased from Sigma Chemical Co. (St. Louis, MO). Dithiothreitol (DTT) was obtained from Calbiochem (La Jolla, CA). [14C-Ring-labeled]tamoxifen citrate (21.1 mCi/mmol; currently available only through custom synthesis) and [3H-methyl]-S-adenosyl-l-methionine ([3H]-SAM, 15 Ci/mmol) was obtained from DuPont-NEN (Boston, MA). Droloxifene was purchased from Research Biochemicals International (Natick, MA). Phenobarbital (PB) sodium salt was obtained from Mallinckrodt (St. Louis, MO). cDNA-expressed human P-450s in baculovirus-infected insect cell line (supersomes) and in lymphoblasts were purchased from Gentest Corporation (Woburn, MA). Human liver microsomes were obtained from the International Institute for the Advancement of Medicine (IIAM; Exton, PA). Ultima-Gold biodegradable scintillation fluid was obtained from Packard Instrument Co., Inc. (Downers Grove, IL). Normal phase thin-layer chromatography (TLC) plates, containing fluorescent indicator and preadsorbent strip, were purchased from Whatman, Inc. (Clifton, NJ). All other chemicals were of reagent grade quality and were used without further purification. Sprague-Dawley CD rats (90–100 g), from Charles River Breeding Laboratories (Wilmington, MA), were housed under controlled temperature (22°C) and light (12-h light/dark cycle; lights off at 7:00 PM.). Rats were injected with PB (37.5 mg/kg i.p. in 0.2 ml water, twice daily) for 4 days and liver microsomes (PB-microsomes) were prepared 12 h after the last dose. A second group of rats was treated with Dex (50 mg/kg in 1.0 ml corn oil daily for 3 days) and liver microsomes (Dex-microsomes) were prepared 24 h after the last injection. Control animals from each treatment group received the same regimen of the respective vehicle only. Rat livers were homogenized in 0.25 M sucrose (5 ml/g liver) at 4°C and microsomes were prepared by differential centrifugation and, unless noted otherwise, represent a pool of four to eight livers (Burstein and Kupfer, 1971; Dehal and Kupfer, 1996). Human liver microsomes, prepared and characterized with respect to their P-450 isoform enzymatic activities, were purchased from IIAM and were used as such. Rat liver microsomes suspended in fresh 1.15% KCl solution were incubated with [14C]-tam or [14C]-4-OH-tam as described previously (Dehal and Kupfer, 1996; Kupfer and Dehal, 1996). The enzyme-catalyzed reaction was terminated by adding 10 ml of ethanol. The aqueous ethanolic solution was filtered through a 2.4-cm Whatman GF/C glass microfiber filter (Whatman, Ltd., Maidstone, Kent, England) in a filter holder (Schleicher & Schuell, Inc., Keene, NH) attached to a vacuum filter flask. The filter containing trapped protein precipitate was rinsed with ethanol (20 ml) and methanol (10 ml) followed by various other organic solvents to remove the loosely bound tam metabolites, as described previously (Mani et al., 1993b; Kupfer and Dehal, 1996). To elute the proteins, the filter was placed in a 20-ml scintillation vial containing 2 ml of 2% aqueous SDS solution and incubated at 37°C for 2 h. The solution was transferred into a 12- × 75-mm glass culture tube and the vial containing the filter paper was rinsed with an additional 1 ml of 2% aqueous SDS solution. The combined SDS solution was processed as illustrated previously (Dehal and Kupfer, 1996). An aliquot of the SDS solution was analyzed for radioactivity by scintillation spectrometry and the rest was used for protein determination. The covalent binding of activated tam metabolites is expressed as picomoles tam equivalents bound per milligram of protein in the SDS solution. Human liver microsomes from IIAM were thawed and used as such in incubations described above for rat liver microsomes. The combined alcoholic filtrate from above was evaporated to dryness under a stream of nitrogen at ambient temperature. The residue was taken up in 2.0 ml ethanol and the radioactivity of an aliquot (10 μl) in duplicate was determined in a Packard Tri-Carb 460 CD liquid scintillation spectrometer using an automatic quench correction curve previously generated with a series of quenched14C and 3H standards. Routinely, 10 to 20% of the ethanolic sample was used for chromatographic separation and quantification of metabolites on TLC and the rest of the sample was stored at 0–4°C under argon for repetition of TLC or for future needs. Chromatographic separation was performed on Whatman silica gel TLC plates and developed in CHCl3/CH3OH/NH4OH (80:20:0.5 v/v/v), slightly modified from the previously described system (Reunitz et al., 1984). Radiolabeled metabolites on TLC were quantified with a System 2000 Imaging Scanner (Bioscan, Inc., Washington, DC). Preparation of Radiolabeled 4-OH-Tam. [14C]-Tam (200,000 dpm, 100 nmol) was incubated as described above with liver microsomes from untreated adult chickens in the presence of NADPH-regenerating system for 60 min (Mani et al., 1994). The radiolabeled 4-OH-tam , the major metabolite formed by chicken liver microsomes corresponding chromatographically to authentic radioinert 4-OH-tam , was eluted off a TLC plate with ethanol and purified further on TLC using the above solvent system. Because of the photo-lability of 4-OH-tam , the experiments were carried out in subdued light. 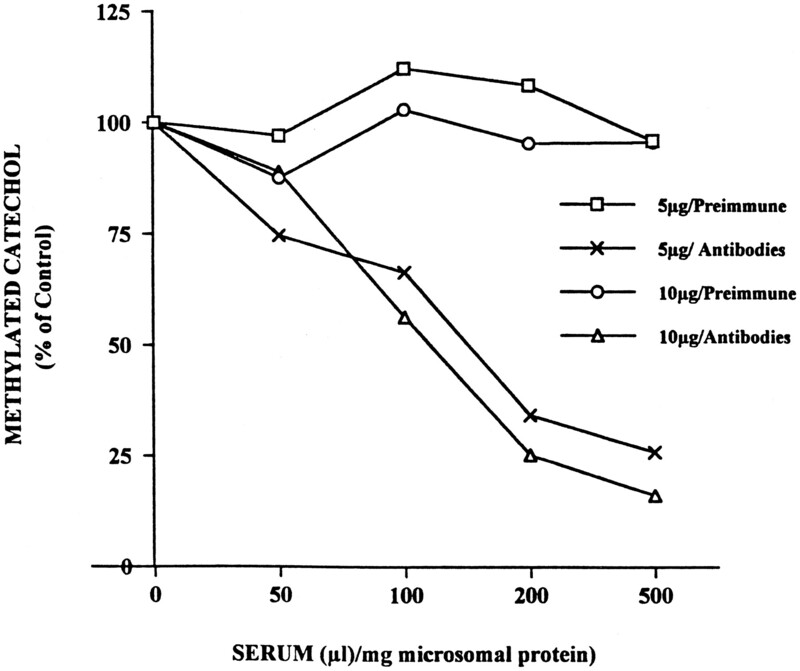 Microsomal suspension (1.0 mg protein or as indicated) was added to 0.6 ml of sodium phosphate buffer (pH 7.4; 60 μmol) containing EDTA (0.1 μmol); 0.1 ml aqueous solution of MgCl2 (10 μmol); radioinert tam, 4-OH-tam (25 or 100 nmol), or 3-OH-tam (25 nmol) in 10 μl of ethanol; DTT (50 nmol in 10 μl); (in rat liver microsomes there appears sufficient COMT to yield optimal methylation, however, with human microsomes, additional COMT was necessary, hence 150 IU in 15 μl was added); [3H]-SAM (1 μCi, 200 nmol in 12 μl H2O) and water to a final volume of 1.0 ml (or as stated in Results). After preincubation at 37°C for 2 min, the reaction was initiated by adding the NADPH-regenerating system (as above in Incubations: Covalent Binding Assay) in 0.1 ml of sodium phosphate buffer (pH 7.4; 10 μmol) and the vials were placed at 37°C in a water bath shaker for 30 min. To terminate the reaction the incubation mixture was placed on ice. The aqueous phase was extracted with ice-cold hexane (2 × 3 ml) by thorough mixing with a vortex. The resulting mixture was centrifuged and the hexane phase was removed. The combined hexane phase was back-washed with 2 ml of water, and after centrifugation the aqueous phase was discarded and an aliquot of the hexane phase containing the monomethylated catechol was taken for radioactivity determination in a scintillation spectrometer (Hoffman et al., 1980; Kupfer et al., 1990; Dehal and Kupfer, 1996). 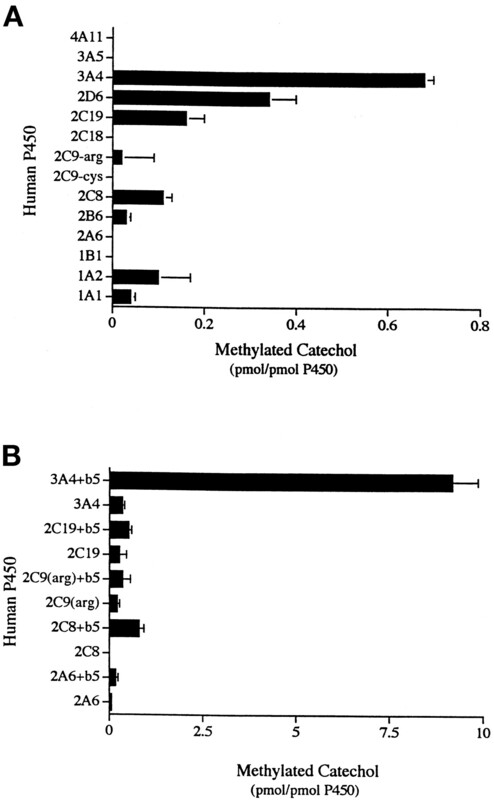 To determine whether ortho hydroxylation and covalent binding of 4-OH-tam are catalyzed by P-4503A enzymes, various amounts of serum from preimmune and from immunized rabbits against CYP 3A4 (containing characterized monospecific anti-CYP3A4 antibodies) were preincubated with human liver microsomes at room temperature (∼25°C) for 30 min and after incubation for 30 min at 37°C the enzymatic activity was determined as above. The broad specificity of hepatic microsomal COMT toward a variety of catechol substrates (Hoffman et al., 1980; Kupfer et al., 1990;Dehal and Kupfer, 1996) suggested that it would be possible to detect formation of catechol-TPEs in situ by the COMT-catalyzed radiolabeled methylation, using [3H]-SAM. Indeed, incubation of 4-OH-tam or 3-OH-tam with PB- and Dex-rat liver microsomes and NADPH in the presence of [3H]-SAM generated the radiolabeled monomethylated tam catechol (Table 1). The monomethylated catechol isolated from incubations of tam, 3-OH-tam, or 4-OH-tam with liver microsomes was chromatographically identical on TLC (not shown), suggesting that the three compounds form the same 3,4-tam catechol. Furthermore, mass spectrometric analysis (electrospray) of the monomethylated catechol [M+ −31(OCH3) + 1 = 387] and the GC/MS/EI of the trimethylsilyl ether of the monomethylated catechol [M+−31(OCH3) = 459; M+−103(tms + OCH3) = 387] supported the assignment of a monomethyl ether of tam-catechol. However, the analysis did not distinguish between the sites of methylation. Catechol formation from tam, 3-OH-tam, and 4-OH-tam by PB-microsomes was linear as a function of microsomal protein concentration; however, it was not directly proportional (not shown). The finding that SKF 525A, metyrapone, and benzylimidazole (inhibitors of P-450) blocked the formation of tam catechols from 4-OH-tam (Table2) indicated that the orthohydroxylation of 4-OH-tam is catalyzed by P-450 enzyme(s). An increase in the formation of tam catechol from 4-OH-tamover that obtained with tam by liver microsomes from Dex-treated rats and the findings that CYP3A enzymes effectively catalyze theortho hydroxylation of phenolic compounds (Stresser and Kupfer, 1997) suggested that CYP3A enzymes are involved in tam catechol formation. To obtain further evidence for CYP3A participation in tam catechol formation, troleandomycin (TAO), a mechanism based inhibitor of CYP3A, was incorporated in the incubations. Although TAO inhibited the 6β-hydroxylation of testosterone, there was only a minimal inhibition of tam catechol formation (not shown). The possibility that the lack of inhibition by TAO was due to the dissociation of the CYP3A-TAO complex by the catechol was considered. The unavailability of a sufficient amount of 3,4-di-OH-tam led to experiments with another catechol (1,2-dihydroxybenzene) as a model. However, 1,2-dihydroxybenzene did not diminish the TAO-mediated inhibition of 6β-hydroxylation of testosterone, indicating that the benzene catechol does not split the complex. Thus, the evidence for CYP3A involvement in tam catechol formation in rats has remained equivocal. A more direct method to demonstrate rat CYP3A involvement in catechol formation would require the use of purified and reconstituted CYP3A. However, the reconstitution of rat CYP3As has been problematic (Eberhart and Parkinson, 1991). Consequently, we resorted to the use of human CYP3A isoforms, which are available in stable and active form, expressed with or without cytochrome b5, in mammalian or insect cell lines. The above findings raised the possibility that human livers could catalyze tam catechol formation from phenolic tam derivatives (e.g., 3-OH-tam and 4-OH-tam). 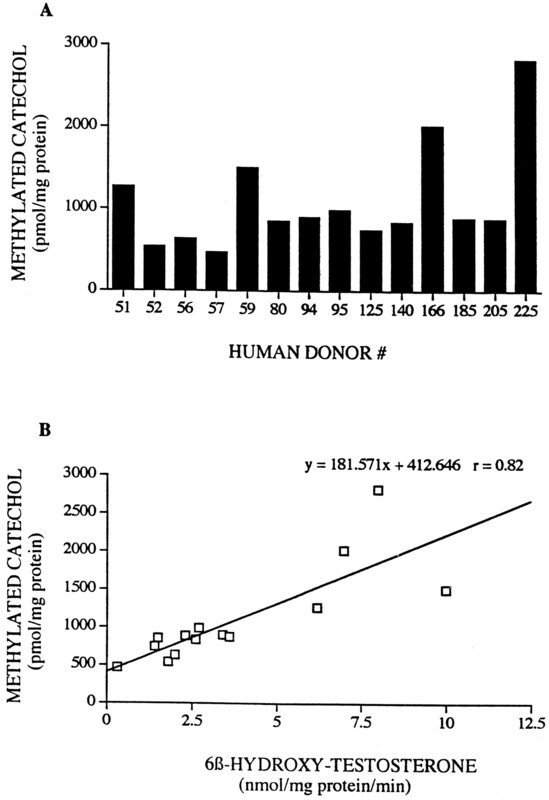 Incubations of human liver microsomes (from 14 donors) with 4-OH-tam generated tam catechol (Fig. 3A and B). Human liver microsomes demonstrated a good correlation (r = 0.82,p ≤ .0004) between 6β-hydroxylation of testosterone (CYP3A activity) and tam catechol formation (Fig. 3B), suggesting CYP3A4 and/or 3A5 involvement. By contrast, the correlation of dextromorphan O-demethylation (2D6 activity) and tam catechol formation by human liver microsomes was not significant (r = 0.05) .Additionally, liver microsomes with high CYP3A activity exhibited high catechol formation from4-OH-tam (Table 3); a notable exception was donor #80, that had low 3A activity but high 2D6 activity, suggesting the involvement of 2D6 in the catalysis (for further evidence see below). Of interest is the observation that human liver microsomes converted 3-OH-tam into tam catechol (Table 3). The formation of tam catechol from 3-OH-tam (approximately 8 nmol/mg protein) was higher than from 4-OH-tam (1.7–3.2 nmol/mg protein), indicating that 3-OH-tam is a better substrate than4-OH-tam. Because the experiment used liver microsomes with high 3A4 and low 2D6 activity and liver microsomes with low 3A4 and high 2D6, it appears that 3-OH-tam is a better substrate for both enzymes. A, catechol formation from 4-OH-tamby human liver microsomes. Human liver microsomes (10 μg protein) were incubated with4-OH-tam (25 μM) in the presence of [3H]SAM (1 μCi/200 μM), DTT (50 μM), COMT (120 U), and NADPH-regenerating system in a final volume of 0.4 ml, at 37°C for 30 min. Values represent a mean of duplicate measurements. B, correlation of tam-catechol formation with testosterone 6β-hydroxylation in human liver microsomes. To further ascertain that in human liver CYP3A4 catalyzes theortho hydroxylation of 4-OH-tam, the effect of monospecific anti-CYP3A4 antibodies on tam catechol formation was examined using liver microsomes with high CYP3A activity (Fig. 4). The anti-CYP3A4 antibodies displayed strong inhibition (>80%) of the transformation of4-OH-tam into tam catechol, indicating that 3A4 catalyzes the major portion of the ortho hydroxylation in this preparation of human liver. Effect of polyclonal antibodies against CYP3A4 on catechol formation from 4-OH-tam by human liver microsomes. Human liver microsomes (5 μg; ■, x and 10 μg; ○, Δ protein; IIAM human donor #225 that contained high level of CYP3A and low level of 2D6 activities) were preincubated with various amounts of preimmune serum (IgG) and polyclonal antibodies against CYP3A4 at room temperature for 30 min. This mixture was incubated with4-OH-tam (25 μM) in the presence of [3H]SAM (1 μCi/200 μM), DTT (50 μM), COMT (150 U), and NADPH-regenerating system in a final volume of 0.4 ml at 37°C for 30 min. 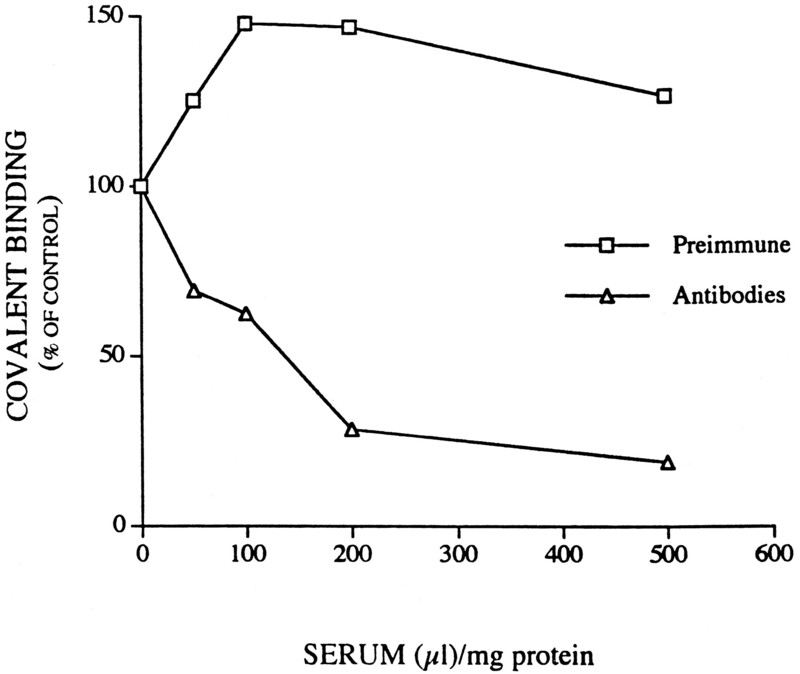 The concentration of protein was almost identical in preimmune serum and serum containing antibodies. Values represent a mean of duplicate measurements. To delineate whether other P-450 isoforms in addition to CYP3A4 exhibitortho hydroxylation of 4-OH-tam, individual cDNA-expressed human P-450s in baculovirus-infected insect cell line (supersomes) were examined. CYP3A4 and to a lesser extent 2D6 were found to be active (Fig. 5A), however, little or no activity was observed with CYP1A1, 1A2, 1B1, 2A6, 2B6, 2C8, 2C9, 2C19, 3A5, or 4A11. Furthermore, cytochrome b5 (coexpressed with 3A4) markedly stimulated CYP3A4 activity and had only little or no quantitative effect on other CYPs examined (Fig. 5B). The unavailability of 2D6 supersomes, with coexpressed b5, precluded the determination of whether coexpressed b5 would stimulate 2D6 activity. The examination of cDNA-expressed P-450s in lymphoblasts toward tam catechol formation from 4-OH-tam demonstrated that CYP3A4 was by far the most active and 2D6 had some activity; however, other P-450s exhibited little or no activity (not shown), providing further support for the above conclusion. A, catechol formation from4-OH-tam by cDNA-expressed human P-450s in baculovirus-infected insect cell line (supersomes). Supersomes containing P-450s (8 pmols) with coexpressed NADPH-P-450 oxidoreductase were incubated with 4-OH-tam (10 nmol) in the presence of COMT (100 U), [3H]-SAM (80 nmol/0.4 μCi), DTT (20 nmol), and NADPH-regenerating system in a final volume of 0.4 ml at 37°C for 30 min. Values represent a mean ± S.D. of triplicate measurements. B, effect of coexpressed cytochrome b5 on catechol formation from 4-OH-tam by cDNA-expressed human P-450s in supersomes. Incubation conditions were as above in Fig. 5A. Because CYP2D6 catalyzes the 4-hydroxylation of tam (Dehal and Kupfer, 1997; Crewe et al., 1997) and the 3-hydroxylation of4-OH-tam (this study), it seemed conceivable that the second hydroxylation could occur sequentially while the newly formed4-OH-tam resides at the enzyme-active site. This suggested that 2D6 would form tam catechol from tam. However, there was no detectable formation of the catechol from tam in supersomes by either 2D6 alone or by a mixture of 2D6 and 3A4 (not shown). This indicated that the amount of 4-OH-tam formed by 2D6 was insufficient to sustain the second hydroxylation by either 2D6 or 3A4. Surprisingly, low levels of quinidine (up to 1 μM), a specific competitive inhibitor of 2D6 activity (Grace et al., 1994), did not inhibit the 2D6-mediated catechol formation from 4-OH-tam in supersomes. Similarly, quinidine (up to 5 μM) did not inhibit catechol formation in liver microsomes with high 2D6 and low 3A4 activity. The lack of inhibition by quinidine is not understood. Possibly theKm of 4-OH-tam and 3-OH-tam is extremely low, hence the competitive quinidine interference is obviated. It was reasoned that if the tam catechol is proximate to the tam-RI involved in covalent binding, then diminution of catechol formation should decrease the covalent binding. 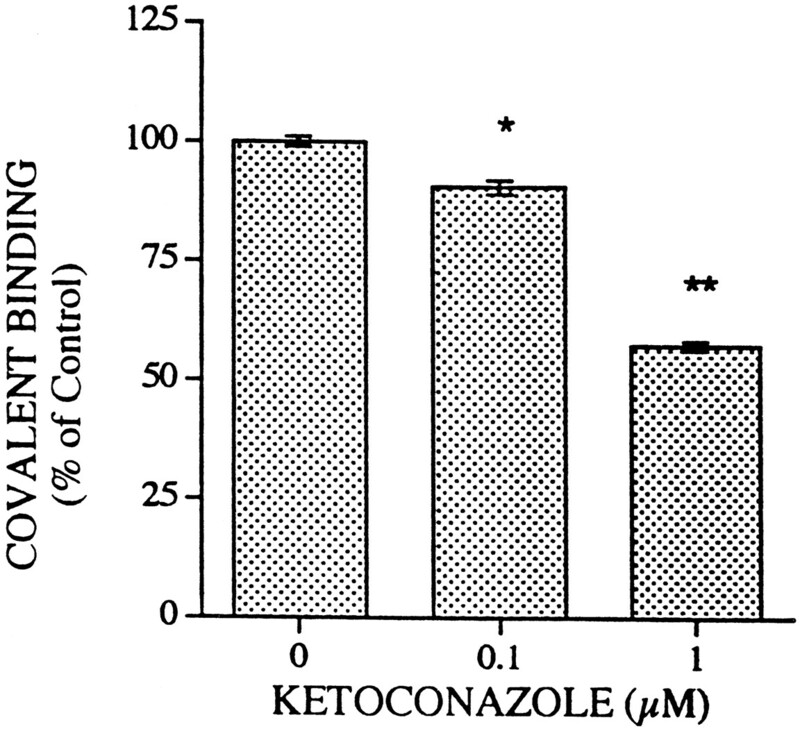 Indeed, an inhibitor of CYP3A enzymes, ketoconazole (KZ) at 20 μM, significantly inhibited both catechol formation (from 4-OH-tam) by 42% and its covalent binding by 88% in Dex-microsomes (not shown). Furthermore, in human liver microsomes, KZ inhibited the covalent binding of metabolically activated radiolabeled 4-OH-tam (Fig.6). The inclusion of low levels of KZ (0.1–0.5 μM) in the incubations of 4-OH-tam with human liver microsomes resulted in 20 to 25% inhibition of tam catechol accumulation; however, surprisingly, at higher levels of KZ (1–5 μM), there was a marked increase in accumulation of the catechol (Table 4). Catechol accumulation may have been due to KZ inhibition of the further transformation of the catechol and/or of the O-demethylation of the [3H]-monomethylated catechol. The latter possibility was excluded because incubation of the [3H]-monomethylated tam catechol with various cDNA-expressed human P-450s did not display O-demethylation (not shown). Additionally, this finding demonstrates that the extremely low or lack of ortho-hydroxylase activity by various P-450s other than 3A4 or 2D6 was not a mere artifact of the loss of radioactivity due to the enzymatic demethylation of the [3H]-methylated catechol by these P-450s. The opposing effects of low versus high KZ concentrations could have contributed to the incomplete inhibition of tam catechol accumulation by the low levels of KZ. An additional complication of KZ action is depicted in Scheme FS1, whereby N-demethylation and ortho hydroxylation (both CYP3A4 activities) are inhibited. We observed that N-desmethyl tam is not as good a substrate for catechol formation as tam and therefore inhibition of N-demethylation of tam may have resulted in increased catechol formation. The possibility that the observed inhibition of catechol formation from 4-OH-tam by KZ was merely due to inhibition of COMT-mediated catechol methylation was excluded. KZ had no effect on COMT-catalyzed methylation of two substrates (2-hydroxyestradiol and 3,4-di-OH-tam) in incubations with rat and human liver microsomes in the absence of NADPH (not shown). Inhibition by KZ of covalent binding of [14C] 4-OH-tam to proteins from human liver microsomes. Sites of KZ inhibition of tam metabolism. The involvement of CYP3A4 in catechol formation (Fig. 4) and in subsequent covalent binding (Fig. 7) was examined with monospecific anti-3A4-antibodies; this resulted in inhibition of catechol formation and covalent binding by more than 80%. These findings provide further support for CYP3A4 involvement in both catechol formation and covalent binding and in the participation of tam-catechol as a proximate intermediate in covalent binding. Effect of polyclonal antibodies against CYP3A4 on covalent binding of [14C]4-OH-tam to proteins from human liver microsomes . Human liver microsomes (50 μg protein; IIAM donor #225 that contained high CYP3A and low 2D6 enzymatic activity) were incubated with [14C] 4-OH-tam (5 nmol/10,000 dpm) in the presence of NADPH-regenerating system for 60 min at 37°C in a final volume of 0.4 ml. Values represent a mean of duplicate measurements. Earlier findings demonstrated that ortho hydroxylation of several structurally diverse compounds (among these estradiol, monohydroxy-methoxychlor and p-nitrophenol) is catalyzed by CYP3A4 (Aoyama et al. 1990; Stresser and Kupfer, 1997; Zerilli et al., 1997). The current study demonstrates that human CYP3A enzymes catalyze the ortho hydroxylation of monohydroxylated TPEs, e.g., 4-OH-tam and 3-OH-tam. Additionally, CYP2D6 exhibits significant ortho hydroxylation activity. The evidence that CYP3A4 and 2D6 enzymes catalyze TPE catechol formation from4-OH-tam and 3-OH-tam stems from the following: 1) there was a good correlation between testosterone 6β-hydroxylation (CYP3A4 activity) and tam catechol formation in human liver microsomes, 2) among cDNA-expressed human P-450s in supersomes, CYP3A4 and 2D6 (both without coexpressed b5) demonstrated significant levels of tam catechol formation, however, surprisingly 3A5 had no activity, 3) low levels of KZ inhibited tam catechol formation in human liver microsomes, 4) monospecific antibodies against CYP3A4 strongly inhibited tam catechol formation, and 5) human liver microsomes containing high levels of 3A4 and low or high 2D6 activity exhibited high levels of catechol formation; by contrast, livers with low CYP2D6 and low 3A4 activity formed less tam catechol. Collectively, these findings demonstrate that 3A4 and, to a lesser extent, 2D6 are the prime catalysts of tam-catechol formation in human liver. Previous studies indicated that CYP3A4 is involved in catalysis of tam activation and covalent binding to proteins (Mani et al., 1994) and data was obtained that suggested the participation of tam catechol in the covalent binding of tam and 4-OH-tam (Dehal and Kupfer, 1996). In the current study, the observed inhibition of covalent binding of 4-OH-tam by low levels of KZ and by anti-3A4 antibodies provides support for that pathway. Of additional interest is the observation that CYP2D6 catalyzes both the 4-hydroxylation of tam (Dehal and Kupfer, 1997; Crewe et al., 1997) and the subsequent catechol formation from 4-OH-tam (current study). It has been reported that 4-OH-tam is formed by CYP3A4 as well (Crewe et al., 1997), however, the rate of CYP3A4-mediated catalysis was extremely low. This indicates that the contribution of CYP3A4 to 4-hydroxylation of tam is minimal. CYP2D6 is polymorphic (Skoda et al., 1988), hence, human subjects with low levels or inactive 2D6 will form only little 4-OH-tam and consequently low levels of tam catechol (independent of whether these subjects had high CYP3A4 activity). Because 4-OH-tam is an approximately 100-fold more potent antiestrogen than tam and could be the active antiestrogen in tam treatment (Borgna and Rochefort, 1981), the low rate of formation of 4-OH-tam may result in diminished tamoxifen therapeutic efficacy. Because CYP3A4 is the major isoform in human liver microsomes (Shimada et al., 1994), catechol formation from 4-OH-tam would primarily be due to CYP3A4 activity; however, it is conceivable that when 3A4 is limiting by being present at low levels (Table 3) or by being inhibited, then 2D6 would be a significant contributor to catechol formation. Of interest is the observation that cytochrome b5 markedly stimulated the ortho hydroxylation of 4-OH-tam by CYP3A4. Earlier findings demonstrated that b5augments the catalytic activity of 3A4 toward 6β-hydroxylation of testosterone and that the b5 effect is due to a positive effector mechanism rather than to an electron transfer (Yamazaki et al., 1996). The question of whether the b5 participation in orthohydroxylation of phenolic compounds involves donation of the second electron or activation of 3A4 by protein-protein interaction requires elucidation. Several studies demonstrated the formation of steroidal catechols from estradiol and estrone (Hoffman et al. 1980; Martucci and Fishman, 1993). CYP3A and 1A2 are the major P-450s catalyzing those reactions (Aoyama et al., 1990; Shou et al., 1997). The interest in catechol estrogens stems from findings of their involvement in covalent binding and possibly in hormonal carcinogenesis (Tabakovic et al., 1996; Yager and Liehr, 1996). The catechol metabolites forming semiquinones and quinones, undergoing redox cycling mediated by P-450 reductase, could lead to carcinogenicity via oxidative damage to DNA (Yager and Liehr, 1996). It has been shown that the formation of quinones by oxidation of certain semiquinones reduces O2 to superoxide anion radical (O2⨪; Nelson, 1982) and metabolism of tam by hepatocytes was found to generate O2⨪; Turner et al., 1991), suggesting that tam semiquinone was formed presumable via the initial formation of tam catechol. In turn, the covalent binding of tam and 4-OH-tamdemonstrated by us (Mani and Kupfer, 1991; Dehal and Kupfer, 1996) appears to be associated with catechol formation. This conclusion was supported by the observations that inhibition of CYP3A enzymes by antibodies inhibited equally both catechol formation and covalent binding. Because TPE catechols are not highly reactive and are not expected to bind covalently to proteins, it is probable that the catechols undergo further metabolism to yield the RIs. The identification of the structures of the TPE-RIs and characterization of the hepatic acceptor proteins binding these RIs require further studies. Tam and 4-OH-tam were a gift from ICI Pharmaceuticals Group (Wilmington, DE). N-Desmethyl-tam was kindly provided by Dr. John F. Stobaugh (University of Kansas, Lawrence, KS) and 3,4-dihydroxytamoxifen was provided by Dr. David McKillop (Zeneca Pharmaceuticals, Macclesfield, Cheshire, UK). We thank Dr. Steven A. Wrighton (Eli Lilly and Co., Indianapolis, IN) for the generous supply of CYP3A4 polyclonal antibodies and Dr. James Evans (Eunice Kennedy Shriver Center, Waltham, MA) for expert mass spectrometry analysis. ↵2 Because 3,4-di-OH-tam catechol is not an end product of tam metabolism, but is further transformed and thus cannot be accurately assessed by chemico/physical means, we used a method that permits methylation of the formed catechol in situ, using endogenous or exogenous COMT and 3H-SAM, and the resulting radiolabeled catechol is quantified by scintillation spectroscopy. The value for catechol formation may represent an underestimation, because of competing oxidative reaction resulting in formation of quinones. However, if the rate of catechol oxidation is much slower than the COMT-mediated methylation, then catechol underestimation would be insignificant. (1990) Estradiol metabolism by complementary deoxyribonucleic acid-expressed human cytochrome P-450. Endocrinology 126:3101–3106. 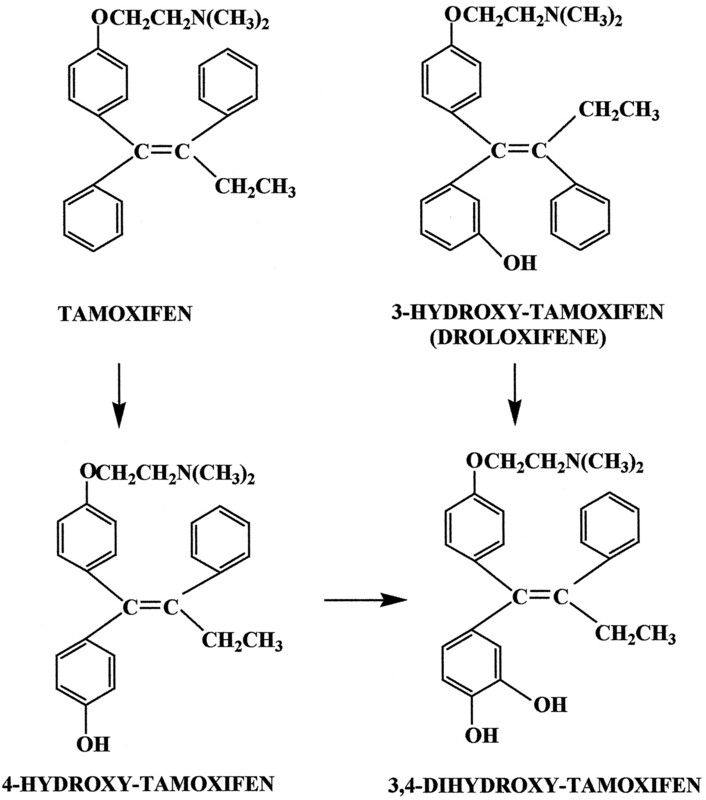 (1981) Hydroxylated metabolites of tamoxifen are formed in vivo and bound to estrogen receptor in target tissues. J Biol Chem 256:859–868. (1971) Hydroxylation of trans-δ- tetrahydrocannabinol by hepatic microsomal oxygenase. Ann NY Acad Sci 191:61–67. (1997) Variable contribution of cytochrome P450 2D6, 2C9 and 3A4 to the 4-hydroxylation of tamoxifen by human liver microsomes. Biochem Pharmacol 53:171–178. (1996) Evidence that the catechol 3,4-dihydroxytamofen is a proximate intermediate to the reactive species binding covalently to proteins. Cancer Res 56:1283–1290. (1997) CYP2D6 catalyzes tamoxifen-4-hydroxylation in human liver. Cancer Res 57:3402–3406. (1991) Cytochrome P450 IIIA (P450p) requires cytochrome b5 and phospholipid with unsaturated fatty acids. Arch Biochem Biophys 291:231–240. (1998) Tamoxifen for prevention of breast cancer: Report of the national surgical adjuvant breast and bowl project –1 study. J Nat Cancer Inst 90:1371–1388. (1980) Metabolism of tamoxifen by rat liver microsomes: Formation of the oxide, a new metabolite. Biochem Pharmacol 29:1977–1979. (1994) Atypical metabolism of deprenyl and its enantiomer, (S)-(+)-N,alpha-dimethyl-N-propylnylphenethylamine, by cytochrome P4502D6. Chem Res Toxicol 7:286–290. (1980) Estrogen-2-hydroxylase in the rat. Biochem Pharmacol 29:83–87. (1991) Identification of the cytochrome P-450 IIIA family as the enzymes involved in the N-demethylation of tamoxifen in human liver microsomes. Biochem Pharmacol 41:1911–1919. 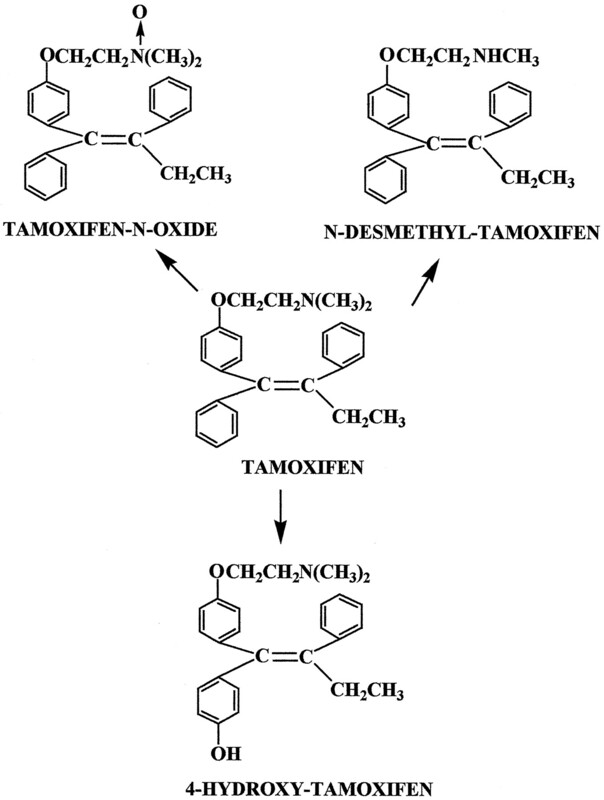 (1993) A current view of tamoxifen for the treatment and prevention of breast cancer. Br J Pharmacol 110:507–571. (1985) Endometrial adenocarcinoma in breast cancer patients receiving antiestrogens. Cancer Treat Rep 69:237–238. (1995) Tamoxifen and the induction of cancer. Carcinogenesis 16:1449–1454. (1996) The covalent binding of tamoxifen to proteins and DNA. in Tamoxifen: Beyond the Antiestrogen, ed Kellen JA (Birkhauser, Boston), pp 201–230. (1990) Metabolism of methoxychlor by hepatic P-450 monooxygenases in rat and human. 1.Characterization of a novel catechol metabolite. Chem Res Toxicol 3:8–16. (1996) Tamoxifen metabolism by microsomal cytochrome P450 and flavin-containing monooxygenase. Methods Enzymol 272:152–163. (1994) Induction of tamoxifen-4-hydroxylation by 2,3,7,8-tetrachlorodibenzo-p-dioxin (TCDD), β-naphthoflavone (βNF), and phenobarbital (PB) in avian liver: Identification of P450 TCDDAA as catalyst of 4-hydroxylation induced by TCDD and βNF. Cancer Res 54:3140–3144. (1993a) Metabolism of the antimammary cancer antiestrogenic agent tamoxifen. I. Cytochrome P-450-catalyzed N-demethylation and 4-hydroxylation. Drug Metab Dispos 21:645–656. (1993b) Metabolism of the antimammary cancer antiestrogenic agent tamoxifen. II. Flavin-containing monooxygenase-mediated N-oxidation. Drug Metab Dispos 21:657–661. (1991) Cytochrome P-450-mediated activation and irreversible binding of the antiestrogen tamoxifen to proteins in rat and human liver: Possible involvement of flavin-containing monooxygenases in tamoxifen activation. Cancer Res 51:6052–6058. (1994) Involvement of cytochrome P-4503A in catalysis of tamoxifen activation and covalent binding to rat and human liver microsomes. Carcinogenesis 15:2715–2720. (1993) P450 enzymes of estrogen metabolism. Pharmacol Ther 57:237–257. (1986) Aspects of metabolism of tamoxifen by rat liver microsomes. Biochem Pharmacol 35:827–834. (1982) Metabolic activation and drug toxicity. J Med Chem 25:753–765. (1995) Microsomal and peroxidase activation of 4-hydroxy-tamoxifen to form DNA adducts: Comparison with DNA adducts formed in Sprague-Dawley rats treated with tamoxifen. Carcinogenesis 16:11–15. (1994) Tamoxifen: Evidence by 32P-postlabeling and use of metabolic inhibitors for two distinct pathways leading to mouse hepatic DNA adduct formation and identification of 4-hydroxytamoxifen as a proximate metabolite. Carcinogenesis 15:2087–2094. (1984) Some chemical and biochemical aspects of liver microsomal metabolism of tamoxifen. Drug Metab Dispos 12:478–483. (1994) Interindividual variations in human liver cytochrome P450 enzymes involved in the oxidation of drugs, carcinogens and toxic chemicals: Studies with liver microsomes of 30 Japanese and 30 Caucasians. J Pharmacol Exp Ther 270:414–423. (1997) Role of human hepatic cytochrome P450 1A2 and 3A4 in the metabolic activation of estrone. Carcinogenesis 18:207–214. (1988) Two mutant alleles of the human cytochrome P-450db1 gene (P450C2D1) associated with genetically deficient metabolism of debrisoquine and other drugs. Proc Natl Acad Sci USA 85:5240–5243. (1997) Catalytic characteristics of CYP3A4: Requirement for phenolic function in ortho-hydroxylation of estradiol and O-demethylated methoxychlor. Biochemistry 36:2203–2210. (1996) Oxidative transformation of 2-hydroxyestrone. Stability and reactivity of 2,3-estrone quinone and its relationship to estrogen carcinogenicity. Chem Res Toxicol 9:860–865. (1991) Evidence for superoxide formation during hepatic metabolism of tamoxifen. Biochem Pharmacol 41:1701–1705. (1994) Frequent and specific mutations of the rat p53 gene in hepatocarcinomas induced by tamoxifen. Cancer Res 54:3864–3867. (1993) The triphenylethylene drug tamoxifen is a strong carcinogen in the rat. Carcinogenesis 14:315–317. (1996) Molecular mechanisms of estrogen carcinogenesis. Ann Rev Pharmacol Toxicol 36:203–232. (1996) Lack of electron transfer from cytochrome b5 in stimulation of catalytic activities of cytochrome P450 3A4: Characterization of a reconstituted cytochrome P450 3A4/NADPH-cytochrome P450 reductase system and studies with apo-cytochrome b5. J Biol Chem 271:27438–27444. (1997) Both cytochromes P450 2E1 and 3A4 are involved in the o-hydroxylation of p-nitrophenol, a catalytic activity known to be specific for P450 2E1. Chem Res Toxicol 10:1205–1212.